QwikLane is a transportation system using compact automobiles equipped with special automatic controls to expedite commuter traffic flow (by holding constant high speed with close spacing) on a low-cost, prefabricated, light-weight, elevated steel guideway; these automobiles retain manual operation for street driving. 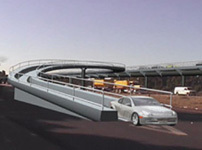 The system can accommodate more than seven times the peak traffic of a freeway lane at a fraction of the cost of construction. 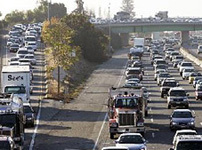 The utility of the automobile and the highway system is threatened by congestion along the urban freeways where land to expand is scarce and construction too costly. Automating driving in guideways built above these congested corridors provides vast capacity improvement, far greater safety (removing the human factor), and better fuel efficiency – without reducing existing highway capacity. Separate, automated highways above the most congested urban corridors can providing free-flow traffic for decades into the future. The entire cost can be privately funded and repaid with relatively low user tolls. QwikLane is a transportation system built around the personal automobile that provides a free-flowing alternative to the gridlock that afflicts our most congested urban corridors. The QwikLane is a low-cost, prefab, elevated steel guideway. Compact automobiles equipped with special automatic controls to expedite commuter traffic flow (by holding constant high speed with close spacing); these automobiles retain manual operation for street driving. 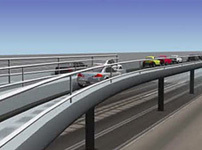 These sections examine various elements of the QwikLane Solution. Automating the Automobile : An idea whose time has come. Dual Mode Vehicles Vehicles : Dual-mode for both the QwikLane and regular streets. Guideways : A revolution in infrastructure creation. Technology : It’s not rocket science. Intellectual Property : The QwikLane Personal Transportation System is patented.